Because we can't put every (Belgian) band on BIMFEST we decided to organise two Dark Demons Nights (04.06 + 18.06) whereupon 8 (2x4) bands will be given the chance to present themselves and battle for fame and glory! On each of these nights the audience can vote for their favorite BIMFEST XV opening band (www.bimfest.be). But first ... YOU will have to VOTE them in the TOP 8 of our Dark Demons Band Poll BEFORE April 1st. PLEASE DO NOT ADD MORE BANDS TO THE POLL AS THEY WIL BE IGNORED ANYWAY! Only VOTES for the signed-in and registered bands listed below will be taken into account! Today we received this sad news from Bruce's partner in crime, Jean-Marc Lederman, of The Weathermen. He was known as the singer of iconic band The Weathermen. He was also a member of the SF band Tuxedomoon. witty, clever, astute and very sharp. A swimmer, too, he loved swimming. Singer and lyricist of The Weathermen, he penned the classic industrial song "Poison" , "Bang" and "Punishment Park". He was a pleasant, easygoing artist we loved to have on our stage. 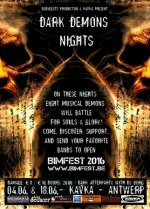 BIMFEST is looking for two Belgian opener bands! We're happy to announce that our line-up for BIMFEST 2016 is almost complete! We only need to select 2 BELGIAN bands to open BIMFEST! Therefore we will organise 2 pre-selection nights at Kavka on Saturday 4th & 18th of June. So if you are interested to open BIMFEST, send us (BodyBeats Belgium) a private message (on Facebook) or E-mail with your information and email address so we can send you the general conditions. - Register before 1st of March! The first names of BIMFEST 2016 revealed! BIMFEST moves to De Casino! Early Bird ticket sales started! Yes we are happy to announce to you our first names for BIMFEST 2016! Since it will be our 15the edition we will turn it in a very special anneversary edition! As the people from the De Casiono are trying to pursuade us for some years now, we made up our minds and decide to give it a go at their fantastic venue! So be aware! BIMFEST will not take place in Antwerp as the past 14 years but in SINT-NIKLAAS. And here are the first BIMFEST XV names!!! à:GRUMH... Yes, unbelievable but true! À:GRUMH…. 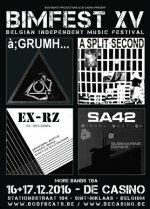 is one of those bands that meet all the BIMFEST criteria 100% … Belgian, good, relevant, important, extraordinary and exceptional. Perhaps the name à; GRUMH ... doesn’t sound as familiar to everyone as for example our national pride Front 242, but this band was together with F242 at the cradle of the Belgian Electro, Industrial and EBM (Electronic Body Music) movement in the early 80's. A SPLIT-SECONDis also one of those legendary pioneers from the early Belgian Wave / EBM scene. People with some musical knowledge will certainly know most of A SPLIT-SECONDS classics such as ‘Flesh’, ‘Rigor Mortis’, ‘Colloseum Crash’ or ‘On Command’. In fact A SPLIT-SECOND, was also one of those bands that made a spectacular comeback at BIMFEST, and they even did this on our very first edition (2002)! Meanwhile the band continues to play concerts and festivals worldwide were their spectacular and energetic live shows manage to surprise friend and foe every time again! EX - RZ is what the name already suggests it is... EX-RZ is the 'solo' project of RED ZEBRA frontman and singer Peter Slabbynck. With EX-R this redhead stage animal brings tribute to Red Zebra and their fans. EX-RZ performs those New Wave classic anthems as ‘Can’t Live In A Living Room,’ ‘The Art Of Conversation’ and ‘Polar Club’ with fire and exactly as you remember them! EX-RZ is punk, EX-R is New Wave, EX-RZ is a genuine BIMFEST must! Maybe we ‘Can't Live In A Living Room', … but we will can party as hell on BIMFEST XV! SIGNAL AOUT '42, or SA42, is the musical project from and around producer and singer Jacky Meurisse. Founded originally as 'Signal' in the early 80’s, they changed the name to SA42 with the release of their first 12" maxi-singles. ‘Pleasure And Crimes’ and 'Girls Of Flanders’ (1986) were both almost immediate club hits and dance floor fillers around the world. Their 12"s and club hits kept coming until 1993. Then, after a hiatus of more than 10 years, SA42 stroke back again with regular and qualitative releases on the renowned German alternative label Out Of Line Records. It’s indisputable, SA42 still for top notch dark but danceable Electro / EBM! Check-in and share our Facebook event here! ONLY 100 EARLY BIRD COMBITICKETS AVAILABLE! More info & tickets on the link below! 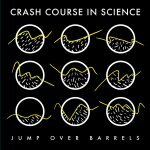 Crash Course In Science have release another 12" on Dark Entries Records. After the successful re-issue release of their long sold-out and original main artefact, the 12" 'Signals From Pier Thirteen', the follow up 12" release couldn't be long in coming. The original 'Jump Over Barrels' was recorded at the Third Story Studio in Philadelphia in 1981, one year after “Signals From Pier Thirteen”. The songs remained unmixed and unreleased at that time for a proposed album titled “Near Marineland”. Lyrically the song tackles overcoming obstacles, be them self imposed or otherwise with vocals interplay between Michael and Mallory. On the A Side are the original mix and a demo mix from 1981. Then on the flip is a brand new remix by prolific Ann Arbor producer Charles Manier, a pseudonym of Tadd Mullinix, who toughens up the track. Also included is an unreleased demo version of the song from 1980, possibly at its rawest and stripped down skeleton. All songs have been remastered for vinyl by George Horn at Fantasy Studios in Berkeley. Housed in a custom-made jacket by our in-house designer Eloise Leigh that incorporates abstract barrel symbols rolling in different positions with the jumping squiggles also changing accordingly riffs of synth knobs and sound wave visuals.